Over a period of time your iPhone can get clogged with junk items and unwanted cached files. Hence, it makes sense to Clear Cache on iPhone or iPad from time to time, in order to improve their performance and make them run faster. Just like any other computing device, getting rid of redundant cached files and other junk file items can give a performance and speed boost to your iPhone and iPad. This is especially true on older models of iPhone and iPad, which can indicate a noticeable difference in performance, once you clear Cache and get rid of unwanted memory hogging files. 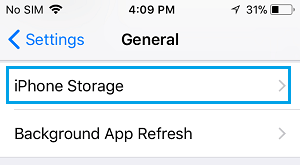 On newer iPhones, clearing the Cache helps in freeing up memory, which in turn improves the performance of your device and helps you get more out of your iPhone. 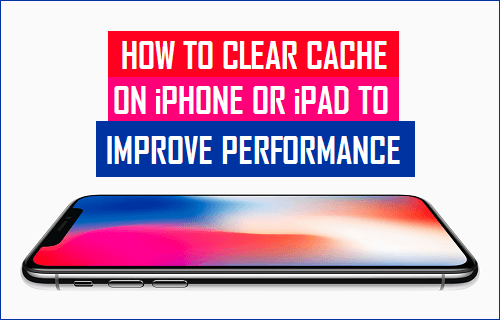 So, let us go ahead and take a look at the steps to Clear Cache on iPhone or iPad and see if this helps in improving the performance of these devices. Whenever you visit websites using the Safari browser on your iPhone, it invariably stores logos, images, CSS and other cachable data from those websites. This function in Safari and other web browsers is designed to speed up delivery of web pages by loading resources from the browser cache, instead of downloading them all over again from the web servers. As you can imagine, Safari Cache can get clogged up with redundant files over a period of time, making it run slower on your iPhone. Hence, it makes all the sense to refresh Safari cache on your device by clearing Safari Cache on your iPhone or iPad. 1. Open Settings on your iPhone or iPad. 2. 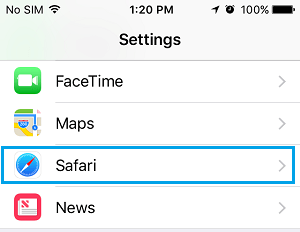 On the Settings screen, scroll down and tap on Safari. 3. On the next screen, scroll down and tap on Clear History and Website Data option (See image below). 4. On the pop-up that appears, tap on Clear History and Data. This will clear all the Cached Files, including your browsing history, cookies and other browsing data, stored by the Safari browser on your iPhone. After clearing Safari Cache on your iPhone, you may notice your favourite websites loading slower than normal. However, things will quickly get back to normal and you may notice improved performance, the next time you visit these websites. Just like the Safari browser, the Apps that you use on your iPhone or iPad store Sign-in Info, Message history and other App related data on your iPhone. 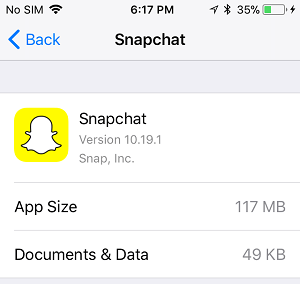 For the sake of convenience, the App Cache or the App related data as stored by the Apps on your iPhone is labeled as “Documents and Data” and it can easily be cleared by deleting the Apps and re-installing them back on your device. 3. On the next screen, tap on iPhone Storage. 4. On the iPhone Storage screen, scroll down and tap on the App storing lots of “Documents and Data” on your iPhone. 5. On the next screen, tap on Delete App located at the bottom of your screen (See image below). 6. Next, you will see a pop-up menu, tap on the Delete App option to delete this App and its related “Documents and Data” from your iPhone. 7. After deleting the App, open the App Store on your iPhone and download and Install the App back on your device. 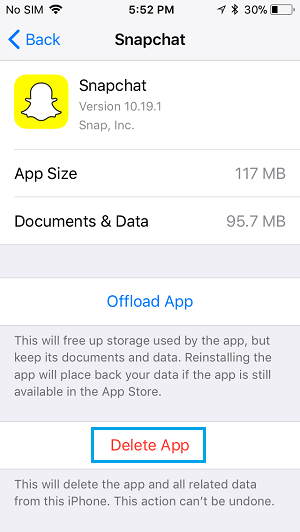 Once the App is reinstalled, check the storage space taken up by the app by going to Settings > General > iPhone Storage > On the iPhone Storage screen, scroll down and tap on the Reinstalled App (Snapchat in this case). As you can see, the storage space taken up by Documents and Data has reduced considerably, going down from 95.7 MB to just 49 KB on the reinstalled App. 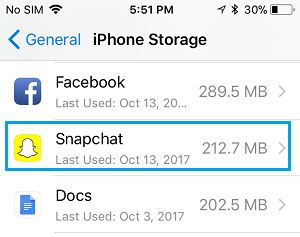 Similarly, you can go through other Apps listed on the “iPhone Storage” screen and Clear “Documents and Data” generated by other Apps on your iPhone. One of the easiest way to clear memory on iPhone or iPad is to simply Restart your device. This simple step has the potential to free up memory on your device by closing unnecessary processes and loops (if any) on your iPhone. 1. Press and Hold down the Power button on your iPhone until you see “Slide to Power OFF” option appearing on the screen of your iPhone. 2. Move the sider to the right and Power OFF your iPhone. 3. Wait for your iPhone to fully Power down. 4. Next, Restart your iPhone by Pressing and Holding on the Power Button. Restarting the device from time to time is particularly helpful on older models of iPhone and iPad.